The final of the West Africa Football Union (WAFU) Zone `A' tournament ended in farce on Saturday night with the hosts Senegal crowned champions after their neighbours and arch rivals, The Gambia (pictured), were disqualified. The match ended 0-0 after 90 minutes but The Gambia refused to play the mandatory extra time claiming they were told that penalties would decide the winner in the event of a tie. The referee ordered for extra time to be played but The Gambia maintained their stance and Senegal were awarded the win. The match official's decision automatically disqualified The Gambia from the competition. 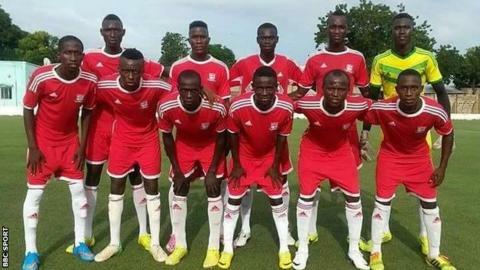 ''We made the mistake during the technical meeting where it was stated that if it's a tie after normal time, penalties will decide the winner - but we realised that the tournament regulations requires extra time and we engaged the Gambian side after normal time but they refused to play", WAFU Secretary Jammeh Bojang told reporters. ''At the beginning of each competition, everyone gets the regulations and we received ours written in English. It explains at the end of regulation time, there will be extensions of twice 15 minutes and if there is still a tie, we move to the series of penaties", said Liberian match commissioner Murvee Gray. ''It's a shame that the tournament ends this way but I thank Senegal for hosting this tournament,'' he added. Senegal came close to breaking the deadlock on several occasions with Nestor Mendy and Gando Ba both hitting Gambia's post. Earlier in the day, Liberia beat Guinea-Bissau 1-0 in the third place match. The Gambia's disqualification means that Liberia now finish second behind champions Senegal and Guinea-Bissau occupy third place in the classifications.